Beyond the protected world of Pedersen Lagoon, storms had been raging along the coast and fjords over the last few days. During our stay at Kenai Fjords Glacier Lodge, we met a few people whose time here was unexpectedly extended due to stormy seas preventing their departure (they were not too broken up about this). There were others on an organized tour of multiple lodges who arrived only to turn around and leave due to the proximity of another storm, the timing of which was likely to strand them here and throw off the rest of their planned tour. I can’t imagine being shown this place only to be told, “Sorry, you’re not staying,” but I imagine they made up for it in other ways later. Left: Path through the rainforest. 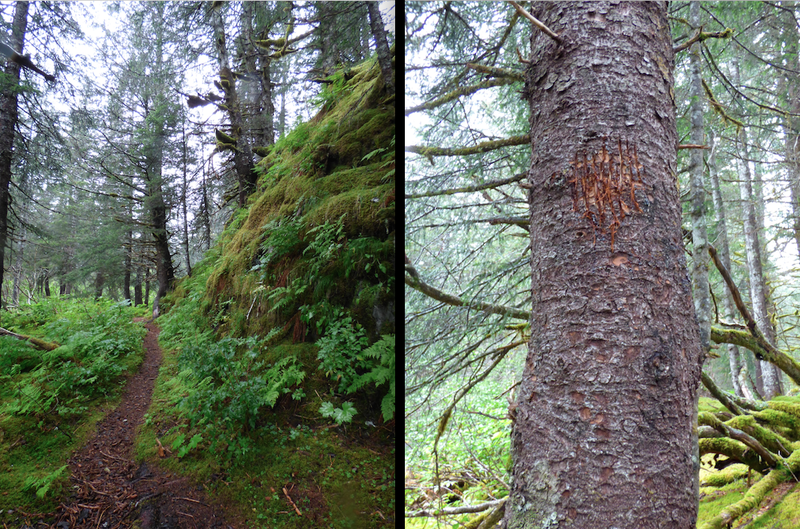 Right: Scratches from a black bear. The weather awoke on our last day at the lodge, realized it had mistakenly given us a partly sunny day with minimal rain the day before, and set out to correct its error to the point of over-achievement. It was cold and raining, and there was a tension in the air regarding the weather. Snippets of discussion were heard here and there regarding the timing of the boat and a short window of opportunity to come and go. It seemed we would be returning to Seward this afternoon on the cusp of another significant storm, and we got the feeling that the return boat trip was going to be interesting. I set an alarm on my watch to ensure I remembered to take my sea-sickness meds at the right time. 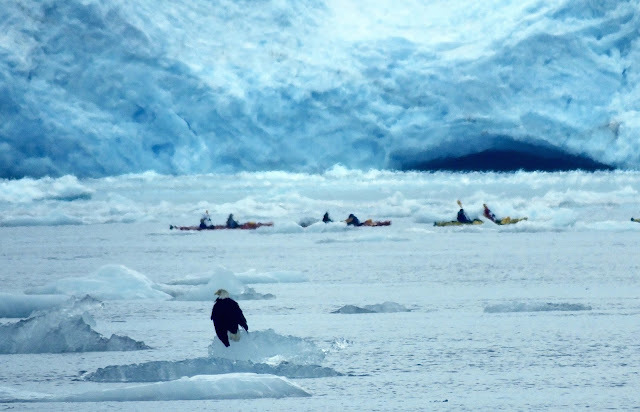 Our final activity here would take us back to Aialik Glacier, this time by boat. But first, we were led through the rainforest for a leisurely walk on a different path to the beach. Moss hung from branches overhead, and a set of perfect scratch marks in a tree revealed bear presence in the forest near the lodge. 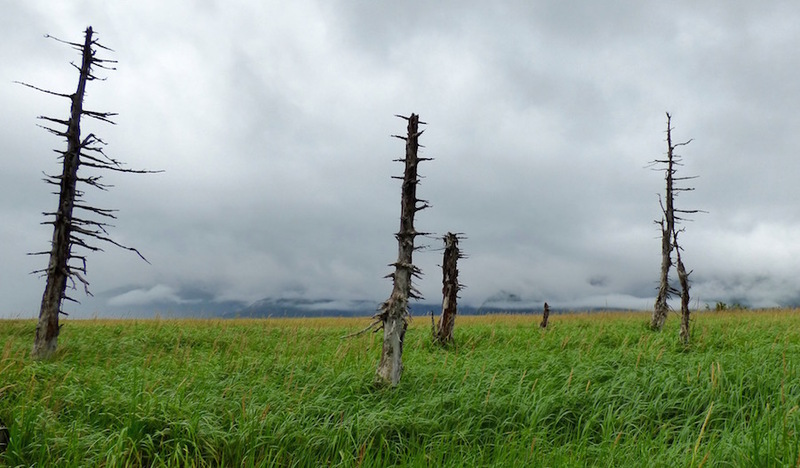 We emerged from the forest into the meadow, which was exceptionally moody this morning. The clouds were low and dramatic, obscuring the mountains in the distance and appearing to reach nearly to the ground. Again, although I had fantasized about clear weather and crisp views, the intense gloom was striking. We continued to a stretch of beach we had not seen yet. Instead of stones, this beach was blanketed with coarse black sand, and the low tide revealed a wide stretch of it littered with small scraps of seaweed. A bear had recently walked this way as well, its paw prints visible in the sand. Our ride, a small boat called Weather or Knot, was waiting for us offshore in the gloom. It was the water taxi that picked up the kayakers on Slate Beach the day before, and Jessica was once again at the helm. She shuttled our group toward Aialik Glacier in what was now a vindictive pelting rain. Without the sun to wash out its color, Aialik Glacier and its iceberg spawn looked amazingly blue. The boat came in close to a few gorgeous icebergs. 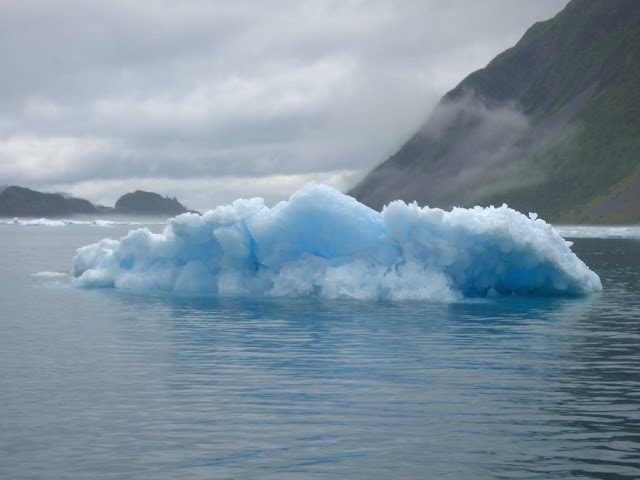 Their color was stunning, with one of them looking like a transparent, mostly submerged mountain range with its peaks just breaking through the water’s surface. (After passing this one, Jessica brought the boat to a dead stop, swung around and went back to it, explaining to those of us within earshot that we had to go back because it was so beautiful. This made Andrea and I very happy; we’d been staring wistfully at it getting smaller in the distance.) With icy raindrops stinging our faces, we stayed on the boat’s deck as long as we could to take everything in. The boat meandered in front of the glacier for a while to allow everyone time to ooh an aah at it (as much as possible given the volatile weather - it was much more comfortable inside the boat), then we began heading back to the lodge, passing a bald eagle perched on a small iceberg and some kayakers paddling close to the glacier. I assume these were experienced paddlers with the skills to navigate close to any calving ice. 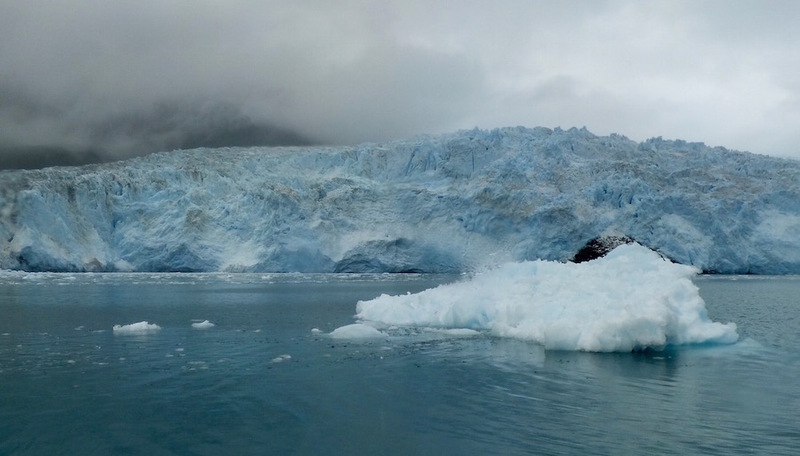 I envied their up-close view of the glacier, but not the conditions in which they were out there. We had been very lucky the day before with good weather for our kayaking excursion. I don't know what to say. Photo by Andrea. As we neared Slate Beach, we slowed down for a few minutes to watch a large black bear—maybe the same one as yesterday, maybe not—walking along the shore before continuing on. Once back on land, Andrea and I lingered in the meadow for a while before returning to the lodge and preparing to leave. The drama was still in full swing, and the view was too magical to ignore. We had mixed feelings about leaving. We would miss our cabin and the beauty of Pedersen Lagoon, but we felt we had stayed the perfect amount of time, and we were excited for the next phase of the trip, where we would experience adventures we had planned ourselves. We walked at the front of the group as we made our way back down the path toward the boat. Along the way, rustling in the grass at the edge of the path caught our attention. 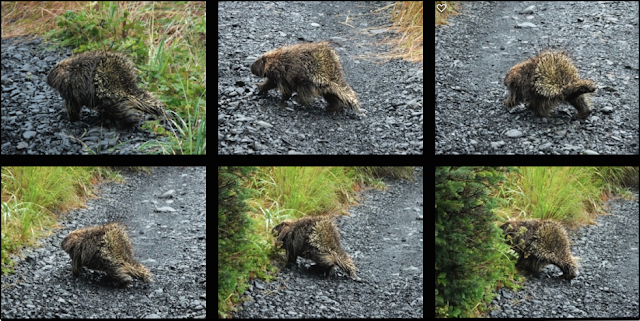 We stopped and a porcupine waddled out of the grass and onto the path in front of us. We were surprised and excited by this unexpected occurrence, as was the porcupine. As soon as it emerged from the grass, it realized that it had lumbered out in front of a bunch of giant, scary animals, and it waddled as quickly as it could across the path and into the safety of the grass on the other side. Andrea photographed it the entire way, ending up with a hilarious set of shots that, when viewed in succession, look like a stop-action movie of the awkwardly fleeing animal. 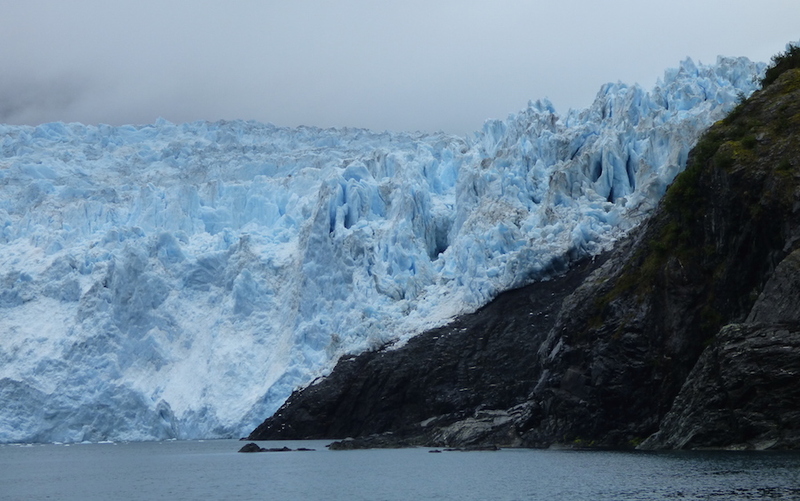 The encounter was an unexpected, final gift from Kenai Fjords Glacier Lodge - a beautiful, truly unforgettable place. Porcupine sampling. Photos by Andrea. The boat ride back was not the leisurely tour we experienced on the way here; it was a race to beat the weather, which continued to grow more threatening. Many puffins were out on the water riding the choppy waves. It was cold, rainy, and rough, and I stayed inside almost the entire time, venturing outside only when some orcas were spotted about 2/3 of the way through the trip. A group of four were swimming very close to shore. One of them was a male with a very tall dorsal fin. Seeing it swimming toward shore, practically right up onto the beach, struck me as disturbing. There were a few cabins just inside the trees beyond the beach, and I wondered who lived there and if it was normal for killer whales to creep up on them like this. This was the only time the boat slowed its pace, and we lingered for a while, periodically losing sight of the orcas when they would dive, then finding them again when they emerged in another location. It was difficult to predict where they would turn up, and I was unfortunately looking off the wrong side of the boat when I heard a collective “Whoa!” from the other side. One of them had suddenly breached, and Andrea was lucky enough to see it. We reached Seward around 6:00 p.m., picked up a rental car, and drove to the Salmon Bake Restaurant and Cabins for dinner and to check into a cabin. Wonderful, unhealthy fish and chips were in order after all of the wonderful, healthy food at Kenai Fjords Glacier Lodge. After dinner, we walked around Seward for a while before returning to our cabin to go to bed. We had an early start the next day, and we were both exhausted from so much looking at stuff. I love following your travels! I live vicariously through you. I'm also learning a lot for future travels with my family. Thank you!